Casa Kresala, Zorritos, Peru | LOOK WHAT WE DONE! The top of Peru is a hotspot for surfers and sun-lovers. With a more tropical climate, gorgeous beaches, and waves from the Pacific lapping the shore, it seems worlds away from the Machu Picchu-style mountain gear that visitors associate with Peru. Mancora is the travellers’ hub of Northern Peru. You’ve got great waves to catch, bars and pubs heaving mid-week, and hostel options out the arse; it almost teeters toward a surfy Vegas (for Aussies, a Peruvian Gold Coast). If you’re looking for a party, that’s your joint. We were not. Siz and I had just finished with 60+ hours of overnight buses in 7 days. We were dead in the water, and looking to put in some serious hammock time. Then we stumbled upon a little slice of paradise in the fishing village of Zorritos. Zorritos is just an hour north of Mancora. The township itself is built along the highway that follows the shoreline, so it’s a few kilometres long, but you’re never more than 3-4 blocks from the ocean. On the street with beach frontage, gazing out over the crispest sand that Zorritos has to offer, lies Casa Kresala. Cleo and Willy met in Zorritos a few years ago and thought each other were pretty OK. Cleo was a Belgian backpacker, Willy a hot local surfer dude, and they hit it off in such a way that they thought they’d make a go of setting up a hostel together in the sleepy town. ‘Casa’ being Spanish for house and ‘Kresala’ being Basque (northern Spanish) for Salty, they built their salty home within walking distance of a nice beginners’ break, so Willy could teach little grommets the basics of surfing at the same time. Zorritos is essentially unknown to the tourist set. 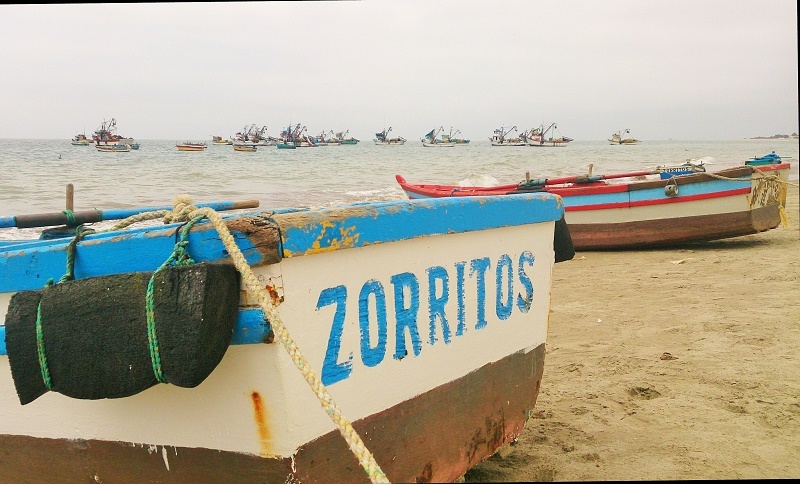 Where Mancora is touristically overdone, Zorritos is the exact opposite – not a gringo in sight. If you walk the main street you get the sense they haven’t seen a tidy whitey in years. You get to eat, ride and swim with the locals, and in Peru that is rare. It also means that Cleo and Willy had no trouble getting a plot of the best land in town on which to build. The gentle breaks out front are great for both surfing and swimming, and you’ll more-often-than-not have the ocean to yourself. Every few months on our travels we hit gold and get to stay at ‘home’ – somewhere that you feel so comfortable being, it’s as if you’ve lived there for years. Cleo and Willy have captured that beautifully. The place just exudes relaxed vibes, and there is zero guilt associated with having 8 straight hours reading a shithouse novel in a hammock with chip crumbs covering your singlet. 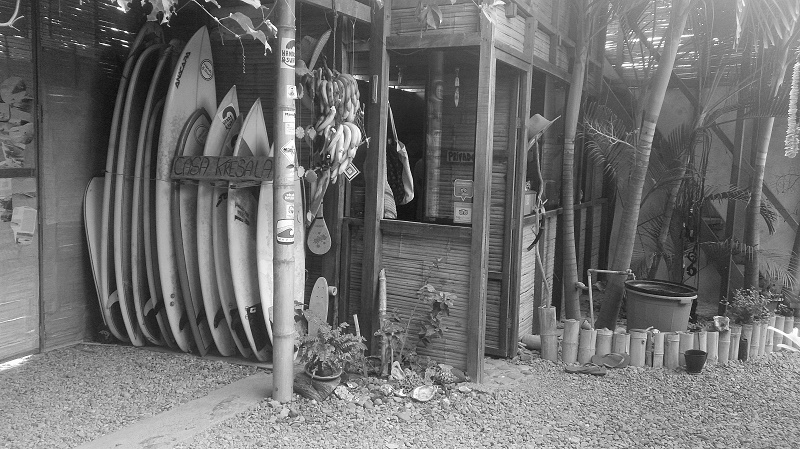 The surf school Willy runs means there are often a few kids kicking around either getting ready for or coming back from a surf, and the pets they keep also add to the homely atmosphere. The bamboo and palm tree look of the place is exactly what you want from a surf hostel, and the layout is optimised to provide the sweetest views of the Pacific. MY SWEET LORD. So get this team – apart from being a hot surfer dude, Willy also happens to be a top-notch professional chef. I know. WHAT A CATCH. So if you’re so inclined, you’ve got the option, for the grand total of $3-$6, to indulge in the finest creations that Willy and the sea-life of the Pacific can combine to offer. And don’t even get me STARTED on breakfast. Firstly it’s free, secondly it’s freshly squeezed/baked/boiled, and thirdly it’s immense. Along with all that we got an ocean view room with private ensuite for a steal, and you can hire surfboards or get a private lesson from Willy at your whim. All this combines to make Casa Kresala not just somewhere that you should visit in Northern Peru, but somewhere you must. If you’re keen to get a slice of the Casa Kresala pie, contact them via their website or Facebook page.